MLA (Modern Language Association) is the style is most commonly used to write papers and cite sources within the liberal arts and humanities. This resource is from the Modern Language Association of America and is the companion guide to the MLA Handbook, Eighth Edition. It provides an excellent quick guide to the core elements of the 8th edition, a review of the concept of "containers," and practice templates for multiple source types. You will also find a handy Q&A section for tricky sources, and tips for formatting your research paper. This comprehensive resource from the Online Writing Lab at Purdue is very popular for good reason. It provides clear examples and descriptions of how to cite most sources and format research papers, in-text citations, and works cited in MLA 8th edition. 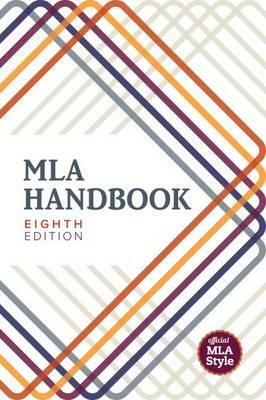 The Eighth Edition of the MLA Handbook recommends a universal set of guidelines, a "new model" that writers can apply to any source. In the new model, then, the writer asks, “Who is the author? What is the title?” and so forth—regardless of the nature of the source. Also, in the new model, elements 3-9 will repeat if the source was located within another source, like an article in a database. Below are differences that might be overlooked by writers making the transition from the seventh edition. Common terms in the works-cited list like editor, edited by, translator, and review of are no longer abbreviated. The eighth edition provides a shorter list of recommended abbreviations. When a source has three or more authors, only the first one shown in the source is normally given. It is followed by et al. Page numbers in the works-cited list (but not in in-text citations) are now preceded by p. or pp..
For books, the city of publication is no longer given, except in special situations. Issues of scholarly journals are now identified with, for instance, “vol. 64, no. 1” rather than “64.1”. If an issue of a scholarly journal is dated with a month or season, the month or season is now always cited along with the year. The URL (without http:// or https://) is now normally given for a Web source. Angle brackets are not used around it. The citing of DOIs (digital object identifiers) is encouraged. Citing the date when an online work was consulted is now optional. Placeholders for unknown information like n.d. (“no date”) are no longer used. If facts missing from a work are available in a reliable external resource, they are cited in square brackets. Otherwise, they are simply omitted. Publishers’ names are now given in full, except that business words like Company (Co.) are dropped and, for academic presses, the abbreviations U, P, and UP are still used. A forward slash (/) now separates the names of copublishers. The kinds of publications that don’t require a publisher’s name are defined. When an organization is both author and publisher of a work, the organization’s name is now given only once, usually as the publisher. No author is stated. The medium of publication is no longer stated, except when it is needed for clarity. Author's Last Name, First Name Middle Initial. "Title of Source: Subtitle of Source." Title of Container, Version, Number, Publication Date, Location. Hannah, Daniel K. "The Private Life, the Public Stage: Henry James in Recent Fiction." Journal of Modern Literature, vol. 30, no. 3, 2007, pp. 70-94. Today, it is more than likely that you will locate articles from a database (e.g. ProQuest, JSTOR), electronic subscription service (e.g. EBSCOhost), or a website. Articles that are located from an electronic source will include the elements of the 2nd container in the second part of the citation. TAKE NOTE: Your instructors may have different preferences for the use of URLs in article citations. When using a URL from a database, always use the permalink when one is provided to avoid expired session URLs. Author's Last Name, First Name Middle Initial. "Title of Source: Subtitle of Source." 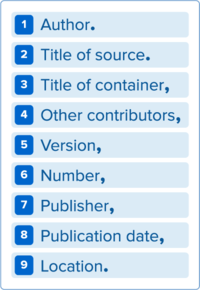 Title of Container, Version, Number, Publication Date, Location. Title of Container 2, URL or DOI. Access Date. Alonso, Alvaro, and Julio A. Camargo. "Toxicity of Nitrite to Three Species of Freshwater Invertebrates." Environmental Toxicology, vol. 21, no. 1, 3 Feb. 2006, pp. 90-94. Wiley Online, doi: 10.1002/tox.20155. Accessed 2 Feb. 2015. Iaconangelo, David. "What Another Ice Shelf Collapse Might Mean for Antarctica and the Planet." Christian Science Monitor, 6 Jan. 2017. Academic Search Complete, http://0-search.ebscohost.com.iii.sonoma.edu/login.aspx?direct=true&db=a9h&AN=120590402&site=ehost-live&scope=site. Accessed 26 Jan. 2017. "Youtuber, Brexit, and 'Get Your Freak On' Enter the Oxford English Dictionary." Time Magazine, 14 Dec. 2016. Time, http://time.com/4603064/oxford-dictionary-new-words. Accessed 16 Dec. 2016. Need More MLA Article Citation Examples? Author's Last Name, First Name Middle Initial. Title of Source: Subtitle of Source. Version, Publisher, Publication Date. When a book is accessed from a database, website, or other electronic source, this information is provided as a 2nd Sometimes elements 3-9 will be listed again in your citation -- if your book was from a database or a website. Include the date of access and URL or DOI, when available, if you use an electronic source. TAKE NOTE: Your instructors may have different preferences for the use of URLs in electronic book citations. When using a URL from a database, always use the permalink when one is provided to avoid expired session URLs. Author's Last Name, First Name Middle Initial. Title of Source: Subtitle of Source. Version, Publisher, Publication Date. Title of Container 2. Access Date. Pustz, Matthew. Comic Book Culture: Fanboys and True Believers. Mississippi UP, 1999. eBook Collection, http://0-search.ebscohost.com.iii.sonoma.edu/login.aspx?direct=true&db=nlebk&AN=25895&site=ehost-live&scope=site. Accessed 12 Dec. 2016. Poe, Edgar A. "The Raven." Short Stories for English Courses. Edited by Rosa Mary Redding Mikels, Project Gutenburg, 2004. Project Gutenburg, http://www.gutenberg.org/files/1065/1065.txt. Accessed 31 Oct. 2016. Need More MLA Book Citation Examples? Author's Last Name, First Name Middle Initial (if one is given). "Title of Source: Subtitle of Source." Title of Container, Publisher, Publication Date, Location. "Athlete's Foot - Topic Overview." WebMD, 25 Sept. 2014, www.webmd.com/skin-problems-and-treatments/tc/athletes-foot-topic-overview. Accessed 2 Feb. 2015. Lundman, Susan. "How to Make Vegetarian Chili." eHow, www.ehow.com/how_10727_make-vegetarian-chili.html. Accessed 15 Dec. 2016. Author's Last Name, First Name Middle Initial (if one is given). Title of Container, Publisher, Location. National Institute on Drug Abuse, NIH, www.drugabuse.gov. Accessed 15 Dec. 2016. Need More MLA Website Examples? Videos, Blogs, Comments, Tweets, and Email will following the standard format involving titles and containers that are used for other entries. “8 Hot Dog Gadgets Put to the Test.” YouTube, uploaded by Crazy Russian Hacker, 6 June 2016, www.youtube.com/watch?v=WBlpjSEtELs. Accessed 2 Nov. 2016. McGonigal, Jane. “Gaming and Productivity.” YouTube, uploaded by Big Think, 3 July 2012, www.youtube.com/watch?v=mkdzy9bWW3E. Accessed 12 Dec. 2016. Sarvas, Mark. "My Top 10 Banned Literary Essay List." The Elegant Variation, 19 Feb. 2014, marksarvas.blogs.com. Jordan, Andrew R. "Re: Attendance Policy." Received by Jessica Robertson, 29 Aug. 2016. TAKE NOTE: When documenting an e-mail message, use the subject as the title. The subject is enclosed in quotation marks. Standard capitalization applies. @ChasingtheMeso. "Moving On to the Championship." Twitter, 11 Sept. 2016, 8:39 p.m., twitter.com/ChasingtheMeso. TAKE NOTE: Identify a short untitled message, such as a tweet, by reproducing its full text or the first part of the full text, without changes, in place of a title. Enclose the text in quotation marks. Need More MLA Examples of Other Media Sources? In order to avoid plagiarism, all information which you gather from someone else’s research or knowledge needs to be both cited in a Works Cited page as well as through in-text citations (also called parenthetical citation). In-text citations are inserted directly into an essay using parentheses. In-text citations must be used to give credit to the original author for paraphrases, summaries, as well as direct quotes. Generally, they are placed at the end of a sentence. points your reader to the proper entry in your Works Cited. The format for creating an in-text citation in MLA Style is to include the last name of the author of the work, followed by the page number of the content used. Mackie, Christine. Life and Food in the Caribbean. New Amsterdam Books, 1992. Need More MLA In-text Citation Examples? MLA style requires a Works Cited page at the end of your research paper. All entries in the Works Cited page must correspond to the works cited in your main text, in other words -- your in-text citations.